In honor of the International Year of Statistics, I interviewed Scott Pammer, a technical product manager here at Minitab Inc. in State College, Pa. Scott works to develop new product concepts and the accompanying prototypes and business plans. 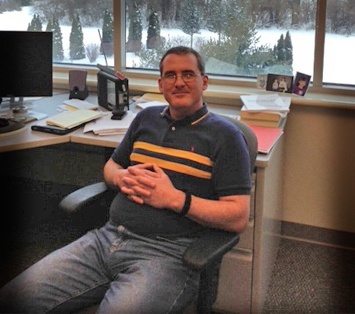 Before taking on the role of technical product manager, Scott worked for Minitab as a senior statistician. In this role, he designed and programmed various features in Minitab Statistical Software. He’s been with Minitab since 1995. What was your journey to becoming a statistician? When I was a senior in high school, I knew I needed to pick a college major. I was always good at math, so I majored in general mathematics because the college I attended did not offer a statistics degree. My dad felt it was important to include practical knowledge in my studies and this lead me to double-major in mathematics and accounting. The accounting paid dividends down the road because it exposed me to business problems. From an early age, I also wanted to become a professor in some kind of math. I always gravitated to applied mathematics and thought statistics was a natural choice. Statistics is solving real problems with data – much less abstract than a proof or a theorem. That’s how I ended up at Penn State majoring in statistics. I got a dual Ph.D. in statistics and operations research, adding operations research to my resume to expose me to another type of practical problem. I came to Minitab because I really enjoyed programming and statistics, and Minitab allowed me to do both. Explaining statistics to a non-statistician is challenging, and it’s also difficult to create statistical output or results that a non-statistician can consume. When it comes to developing new product concepts, the challenge is the uneasiness. Will a person pay money for the product and will it be profitable? It is one thing to say, "Yes, I like your idea," but it’s another thing to actually write the check. It’s tough to know if you have the right idea that will be both successful and profitable. What is the most interesting problem you have used statistics to solve? I did my dissertation on forecasting the penetration of a new product into a marketplace. This was both an interesting and challenging problem to solve. I was able to use the penetration of a similar existing product in the marketplace to greatly improve the forecasts. For example, if you were trying to figure out the penetration of color televisions in the marketplace, you could use a technological substitution – like a black-and-white TV – to gain some insight about the penetration of color televisions. While at Penn State, I also worked in a consulting role, using statisticsto solve all kinds of biological applications. My advisor in college taught me to relate every problem to something you know well, and then break it down into pieces to make the problem more manageable to solve. This advice has served me well over the course of my career. Another thing that is overlooked is communication. Working on your communication skills and being able to communicate statistical results to non-statisticians is very important. Even if you have a smart mathematical brain, you still need to work at your communication with people outside the mathematics field. I got involved in consulting because it forced me to talk to people in various fields. It helped me understand how others think and talk, and this made it easier for me to communicate statistical subjects.